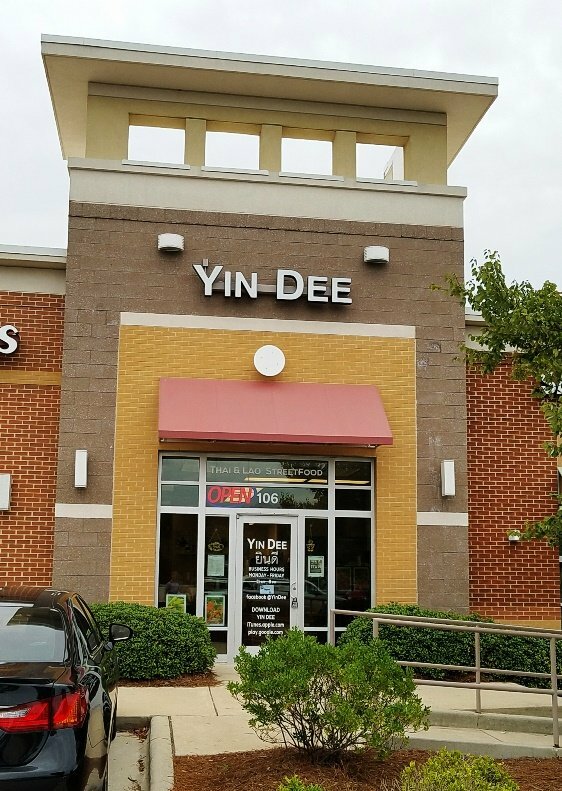 Finding Yin Dee is a bit of a challenge, it sits in a strip plaza near Chapel Hill Road and I-540 next to Perimeter Park. There’s a bit of construction here, so take Carrington Mill Blvd if you’re coming from the north. Hours are pretty simple, 11am to 8pm Monday to Friday so don’t try to visit them over the weekend! 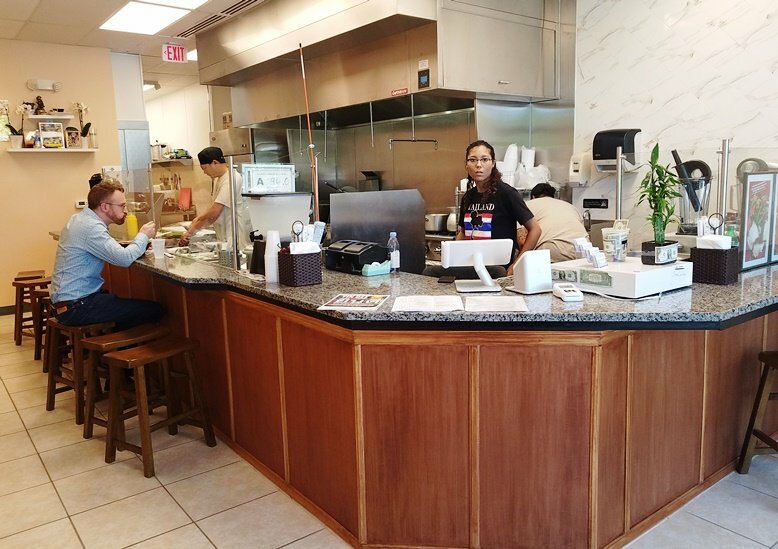 Up front you’ll immediately notice Yin Dee’s narrow storefront and inside you’ll quickly realize why. 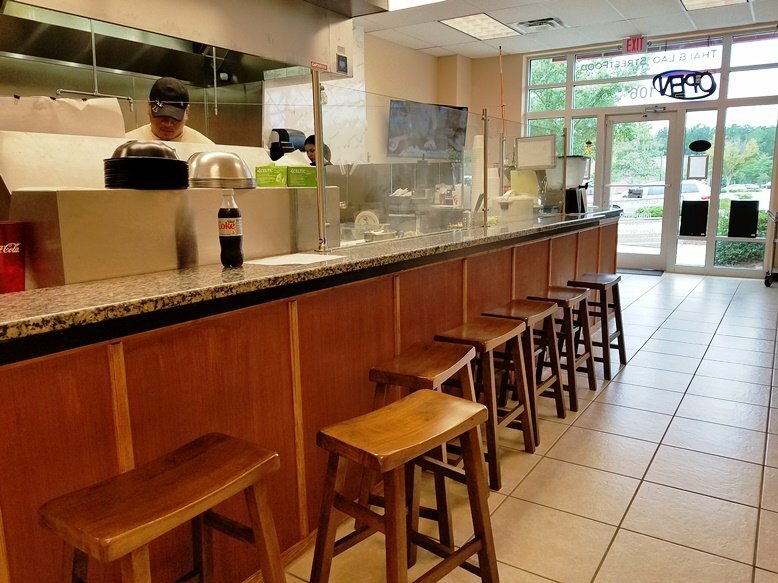 Yin Dee is a very simple counter order set-up with some stool seating by the open kitchen and a side-wall. The stool are back-less and Asian in design so you’re not here to lounge around at all, just stop in, eat and get out, hence the street-food concept. Or of course you can do take-out like I did! Yin Dee does have a website but there was no menu posted there (when I visited) so I had no idea what to expect. The menu at Yin Dee fits on one page and offers a handful of appetizers, soups and noodle bowls. 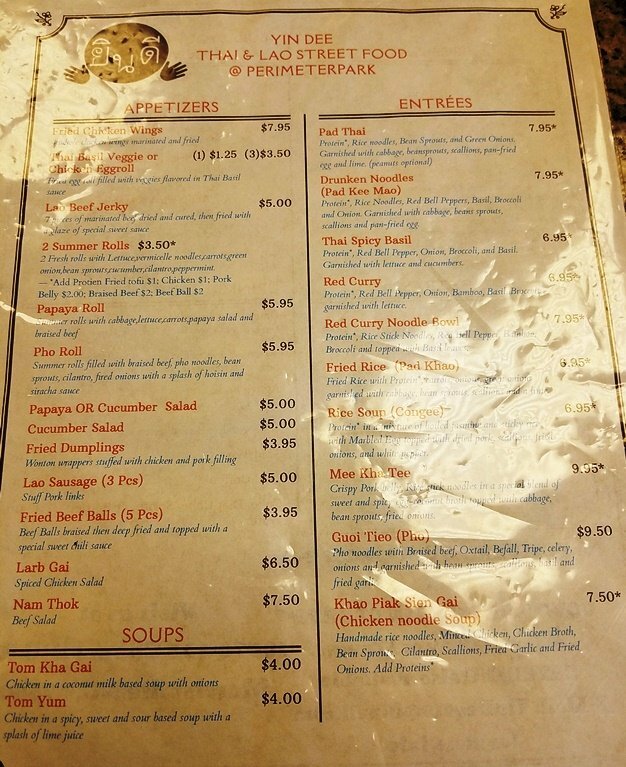 It looks primarily Thai with a handful of Lao specials thrown in. Everything is $4 to $10 so it’s an inexpensive meal here and you can customize it with your choice of protein (chicken, pork, tofu). Spicing is handled at a 1 to 5 level and it’s the real deal. Even a #3 level of heat brought sniffles out of this hungry guy! 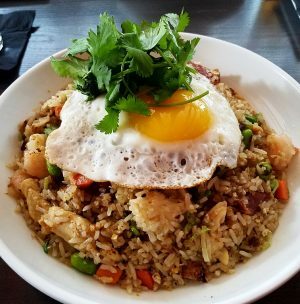 Over the course of a couple of visits, I’ve tried a handful of their appetizers and the pad kee mao. While the dumplings were just ok, the summer rolls stuffed with pork belly were great! As mentioned before, you can choose your protein and on a whim, I went with the belly. 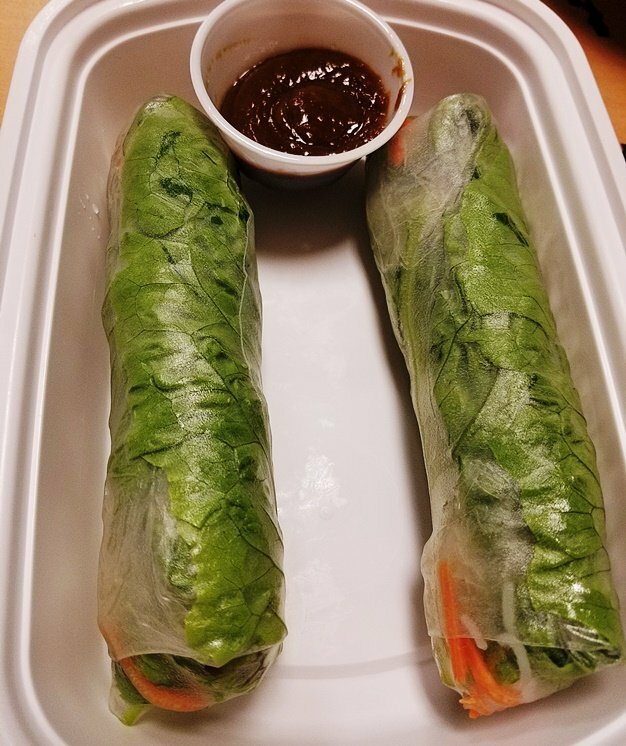 These summer rolls were B-I-G, nearly 10″ long and well stuffed with noodle, carrots and basil. Paired with the peanutty hoisin sauce, there’s nearly enough for a meal here. The pad kee mao was less successful for me. Yin Dee uses rice sticks vs. the wider, flat noodles which changes the texture of the dish. Chicken was a bit scarce but I can tell you for heat, they bring it at Yin Dee. It’s a good portion size but covered with some sliced cabbage and eggs strips. 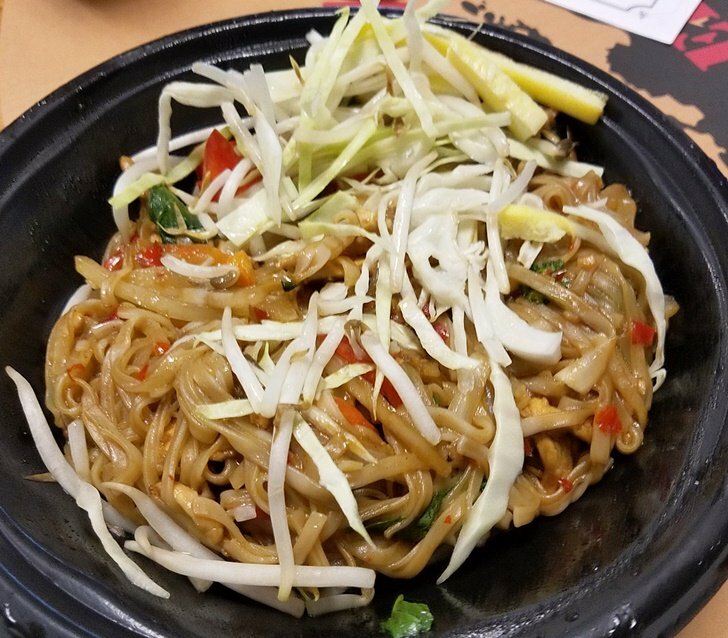 Unusual and different from pretty every other pad kee mao I’ve tried!